Finding reliable kitchen hacks can be the difference between a brilliant shortcut and a real waste of time, so I've done the work for you by trying out some of the more recent suggestions from various sources. 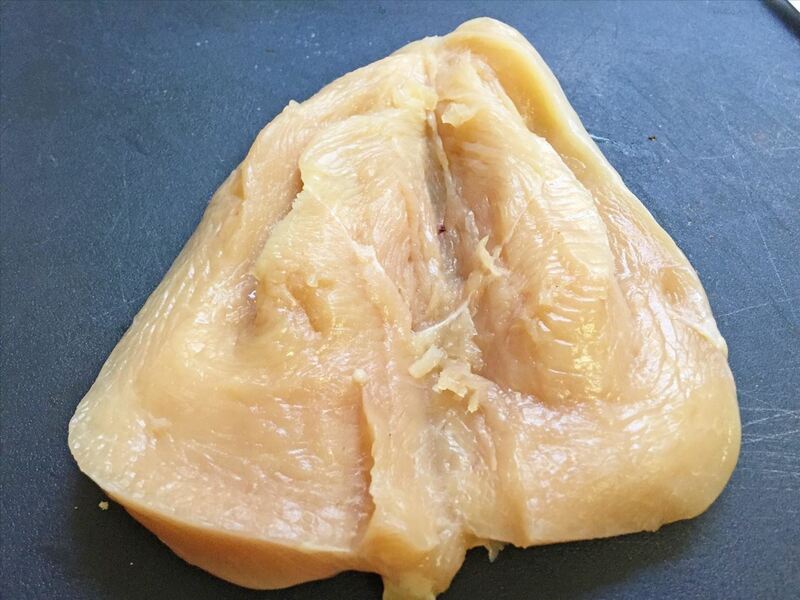 The trial: I sharpened my knife first, as I normally would before cutting a chicken breast, then misted it until I could see droplets of water on the knife. I followed protocol by angling my knife perpendicular to my cutting board and got to slicing. 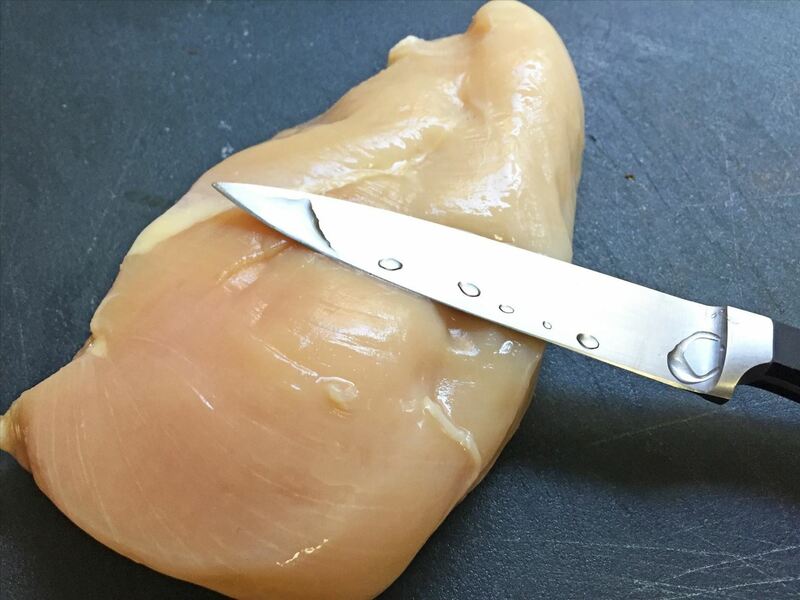 I definitely felt like I had an easier time cutting the chicken (my knife skills are middling at best), but it could be attributed to my being more careful than normal whilst testing the hack. In regards to misting your knife first, as my grandmother was fond of saying, "It couldn't hurt!" The trial: I used the chicken I'd cut for Hack #1 to make breaded cutlets for dinner. 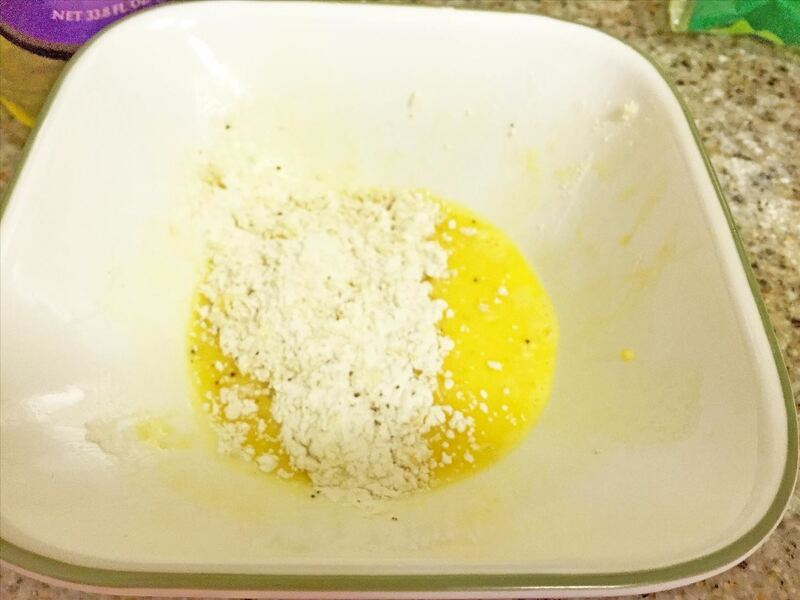 Full disclosure: I only had two cutlets, so I used a small amount of flour, one egg, and only ¼ cup of panko crumbs. But I wanted to create a really crispy exterior, so I put about ¼ cup oil in the pan and fried my cutlets. I removed them from the pan, and tossed my leftover breading ingredients in, then swirled the pan. The hack: If you first parboil and drain potatoes, then return them to the pan and shake them vigorously, you will get crispier chunks. This hack is actually its own article on Food Hacks already, but I wanted to try it myself and document the results. The trial: I peeled stripes into the skins of each potato and cut them into bite-sized chunks. I then parboiled them, drained them, and put them back in the hot pot for a vigorous shaking. 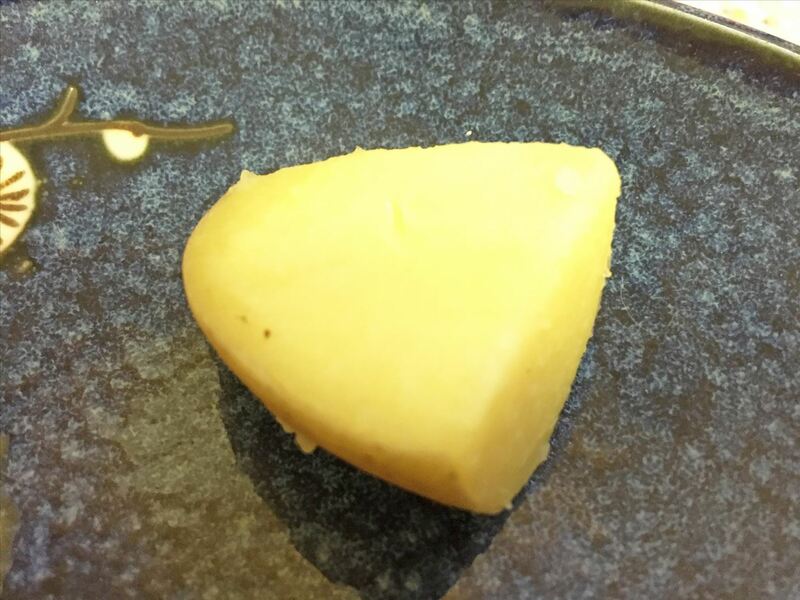 I examined the potatoes for the "fuzz" that was touted in the recipe, and I was surprised to see that the potatoes did, in fact, have a bumpier exterior than when I'd first cooked them. Next, I put the potato chunks in a pan with preheated oil and roasted them as instructed. 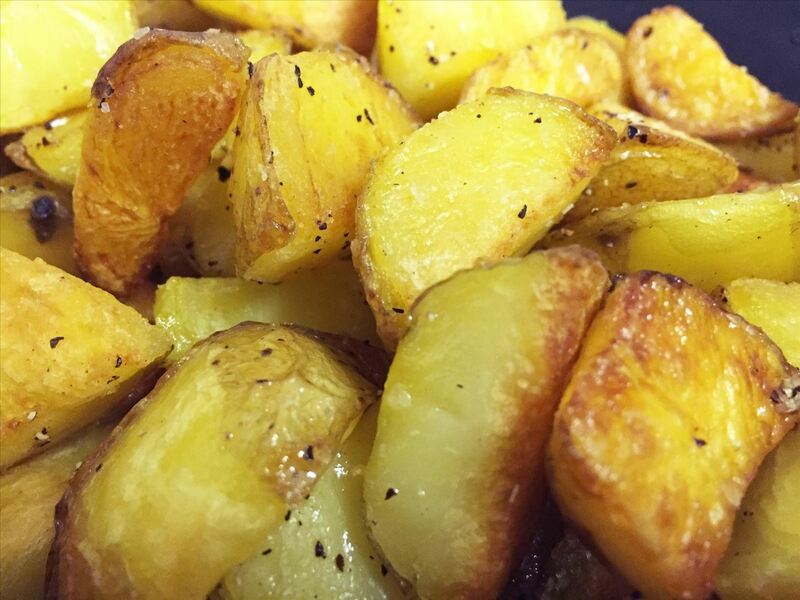 I am renowned in my family for making terrific roasted potatoes, but I have to admit that these were even crispier and better than my usual ones. I'm a convert: I'll be parboiling, shaking, and then roasting my potatoes from now on! 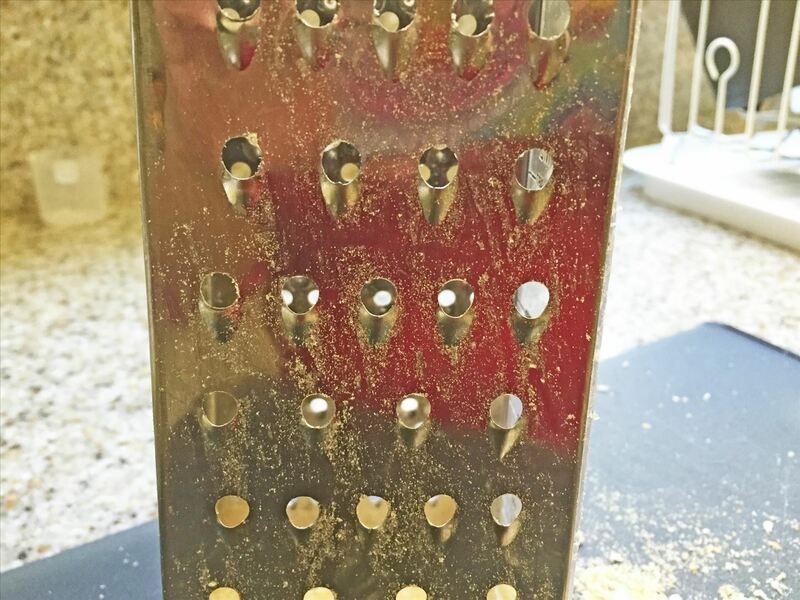 The trial: I grated 4 ounces of Monterey Jack cheese, leaving the expected cheesy mess on my metal box grater. I then took the stale heel of a loaf of sourdough and raked it over the same side of the box grater, making sure to cover the entire surface. I really thought I'd end up with a cheese-and-crumb mess, but the bread took off all of the gooey residue. 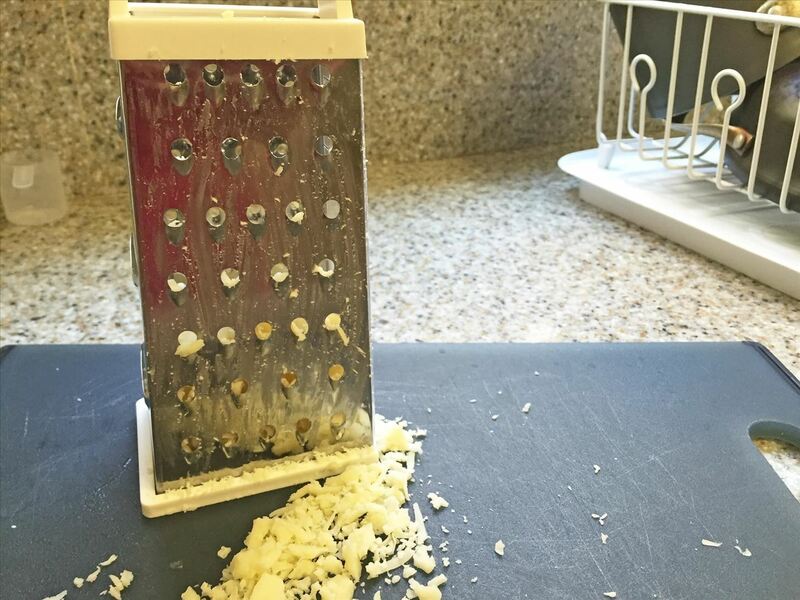 In fact, if I'd needed to use the grater again right away (since it's quite useful in the kitchen for more than just cheese), I could've gotten away with just wiping it with a paper towel before reusing it. The trial: I followed the instructions exactly, although I will admit I wrung out my towel because I was worried about it sticking to the bottle and other items in my freezer. While there is no question the wine was chilled, I had a devil of a time removing the frozen towel, and I was left with a wet towel to deal with after. But if I'd forgotten to put my wine in the fridge before company came over, or someone brought me a bottle of wine I wanted to serve that night, I'd definitely use this again. 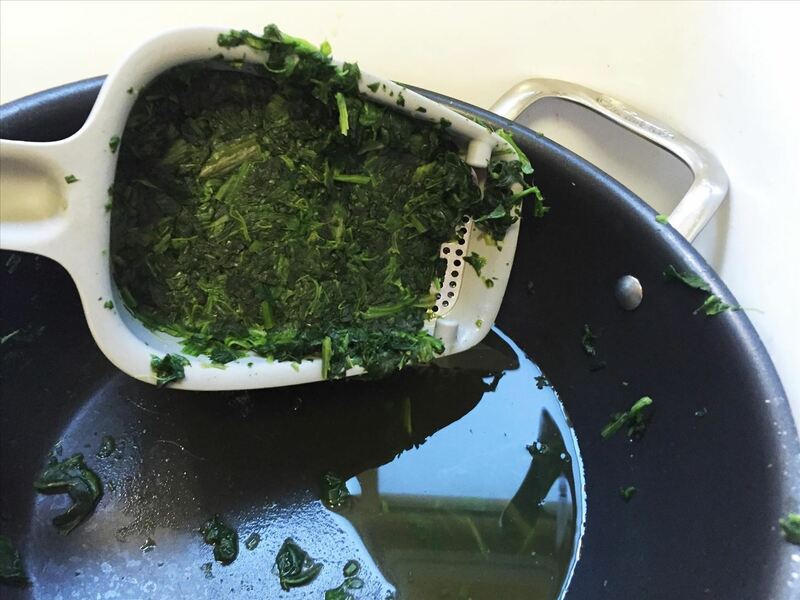 The hack: When draining cooked fresh or frozen spinach, drain the water by using a potato ricer. This is another interesting trick from one of our former articles that looked so easy and convenient, I had to give it a try! The trial: I actually used this as an excuse to buy a potato ricer. 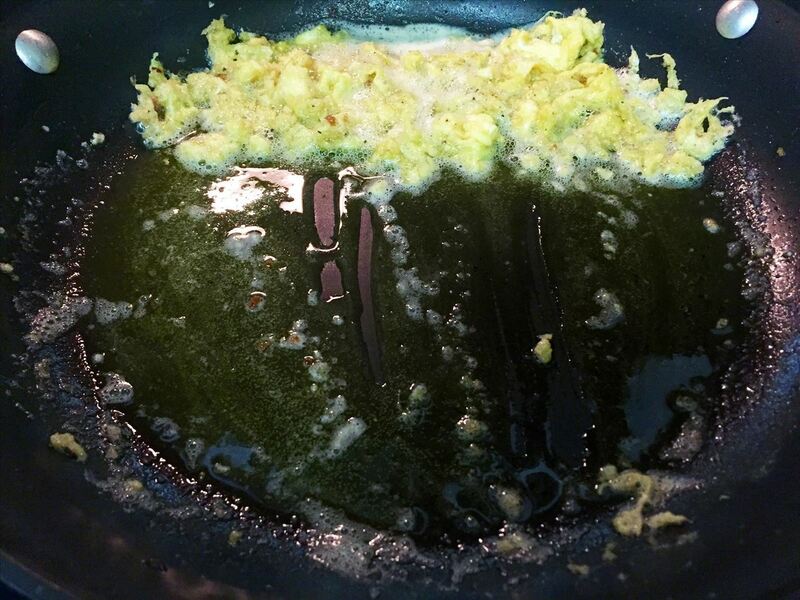 I cooked a small package of chopped spinach according to the instructions, and then used the scoop part of the ricer to get all of the spinach out of the pot. I then squeezed the dickens out of it using the press part of the ricer. Some of the spinach came out over the top, so I opened the press, nudged the spillover back in and pressed some more. 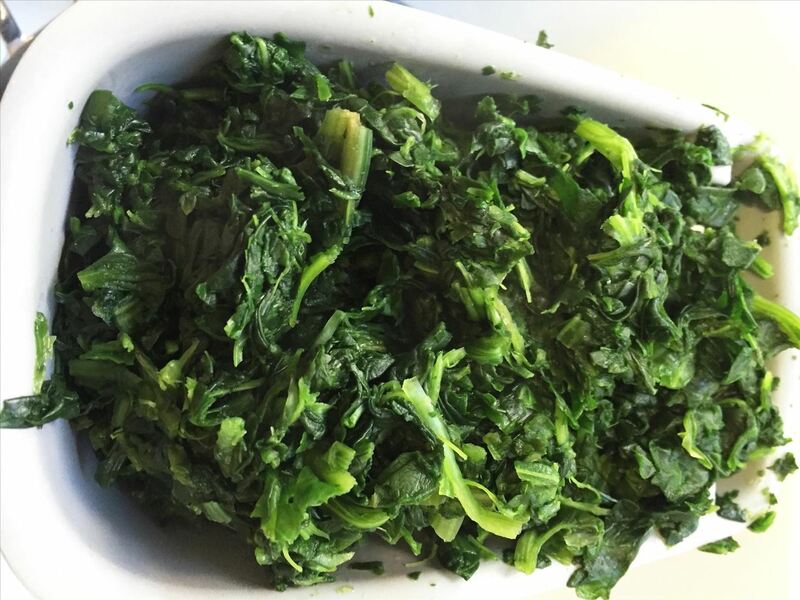 In the past, I would use a clean dishtowel and squeeze all the water out of the cooked spinach, not only staining the dishtowel but also often burning my hands on the hot water that came out. This was so much better: no stained towel, hands well away from hot spinach and my spinach came out much drier. Potato ricer purchase validated and hack proven! 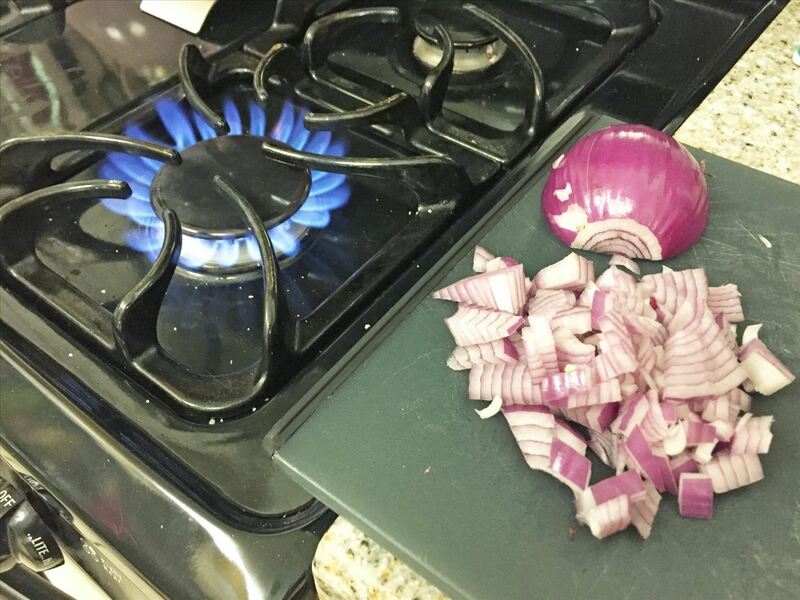 The trial: As suggested, I turned on my gas burner and cut up three whole onions next to the open flame. It worked! I have to admit that I was pretty surprised: usually I am a weepy mess a couple of cuts into this process, yet I was able to cut up all three onions with nary a tear. If you don't have a gas stove, it is also suggest that you can light a candle or two next to your cutting board. The idea is that the flame draws the offending odors away from your eyes, so I see no reason why this wouldn't work as well. 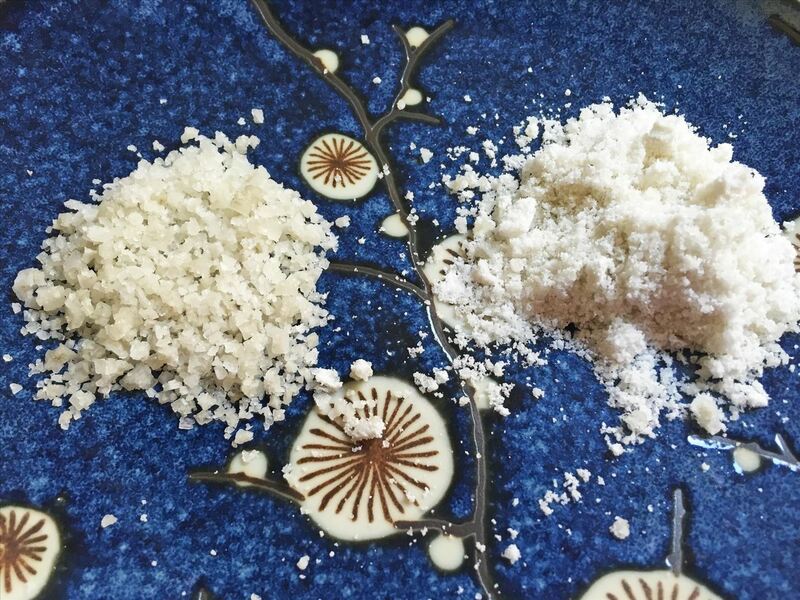 The trial: Using a spice/coffee grinder, I ground some coarse sea salt until it was superfine. 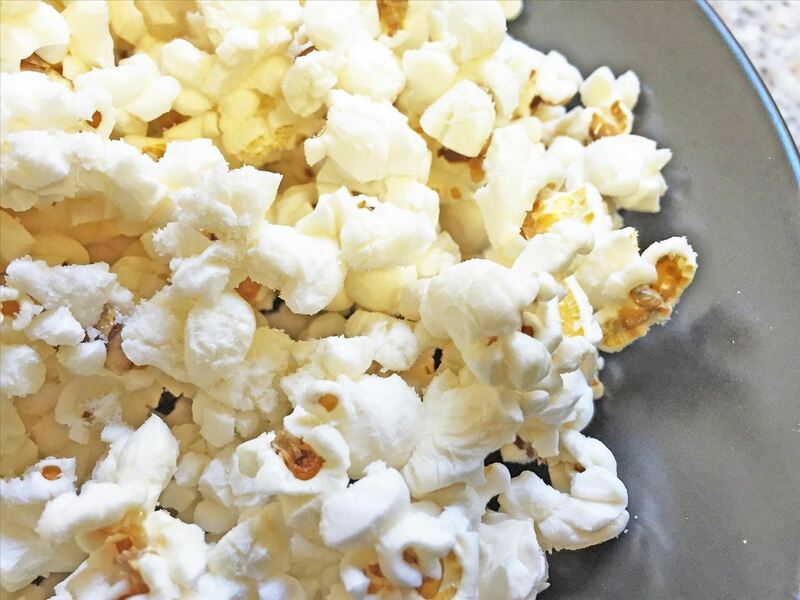 I popped a pot of popcorn using a tablespoon of oil, then tossed it with the salt. The salt clearly stuck well to the popcorn, and I definitely had a lot less salt at the bottom of the bowl than I usually do… but I still had salt leftover at the bottom of the bowl. That said, I would definitely do this again if I had the wherewithal to think ahead and fine-grind my salt before I began popping my corn. There are so many variables that can affect a kitchen hack that for many of these tricks (and others), you won't know if they will work for you until you try them yourself. And there are many, many others out there —some tried-and-true, others nothing more than old wives' tales. Let us know in the comments what your favorite kitchen hacks are and how you proved them; sharing is caring, especially when it comes to our Food Hacks community! Wine chilling: Put the bottle in a plastic sac and don't wrap the towel over the shoulders of the bottle. The plastic is unlikely to stick if dry inside, and your bottle isn't trapped by frozen towel. Crisper fried foods. Never drain the foods on a paper towel covered plate as this traps steam which moistens your food. Use a cake rack on a baking sheet to catch the drips. Great tips - thank you! Totally going to try the wine tip this weekend!